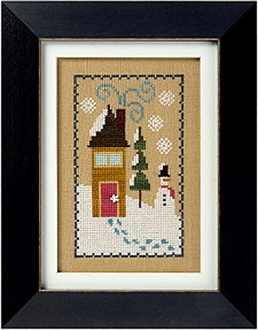 An adorable design featuring a tall snow-covered cottage, snow-drifted tree and snowman in the yard. Part of Lizzie Kate's 6 Fat Men Flip-It series. Chart includes tiny snowflake button. Design size: 3.5" x 5.75". Model stitched 2 over 2 on 28 count Amber Linen (sold separately, see item 31-134). Stitch count: 49w x 81h. Instructions given for Weeks Dye Works/Crescent/Sampler threads with conversions given for DMC and Anchor embroidery threads (not included).